I think this was in a big box of stuff my neighbor gave me. The screw was rusted and jammed tight against the metal handle ferrule. The lower jaw (the one with the screw) was bent to the side and twisted. For a few weeks it served on the floor as a stop to keep the chipmunk from coming into the garage where a piece of gasket was missing on the roll up door. I freed up the screw, disassembled the parts, lightly wire wheeled/brushed everything, then brought it to work. I put the lower jaw in the vise and "untwisted it" with a large adjustable wrench. Then I grabbed some metal blocks and went to the hydraulic press. It took about three different bends but I got it to line up correctly. These things don't seem to have great monetary value but I suspect this will serve well in my home shop. Any USA tool is worth saving, no matter its value. 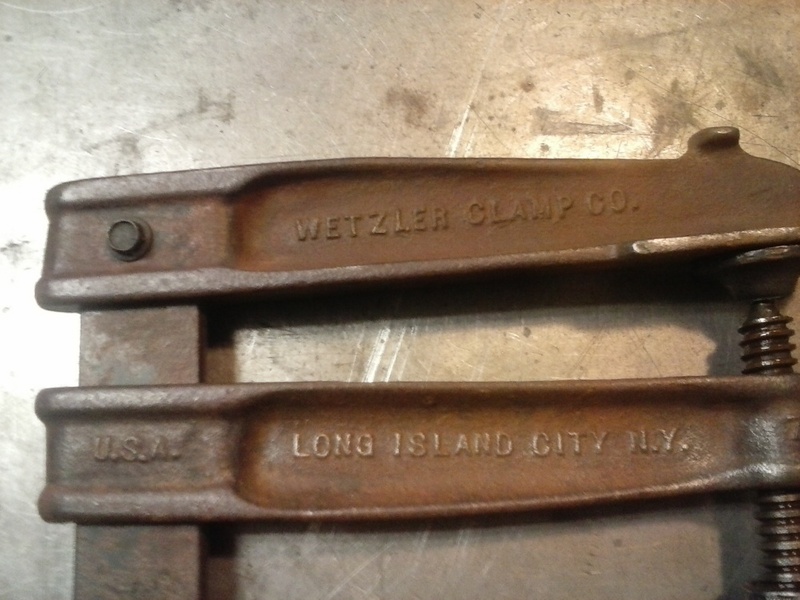 Wetzler clamps are much respected, so you've salvaged a good tool. Nice old clamp. It reminded me of a similar clamp I have. A Colt cam-lock bar clamp similar to this one--although because of a small flaw, mine is marked Co t. It came from Batavia, NY, east of Buffalo. Nice save on that clamp. While researching Wetzler I found this site http://theclampguy.info/site.htm. Why is there a small anvil-like thing cast into the top clamp piece? It seems like its there to hit with a hammer? Why would that be necessary? Maybe it fits in a slot for storing it when not in use? I asked that question on another forum a year or so ago, and someone pointed out that the little bump is level with the clamp head at the bar end, so that, if you set the clamp on the floor on its head, it won't fall over as easily. 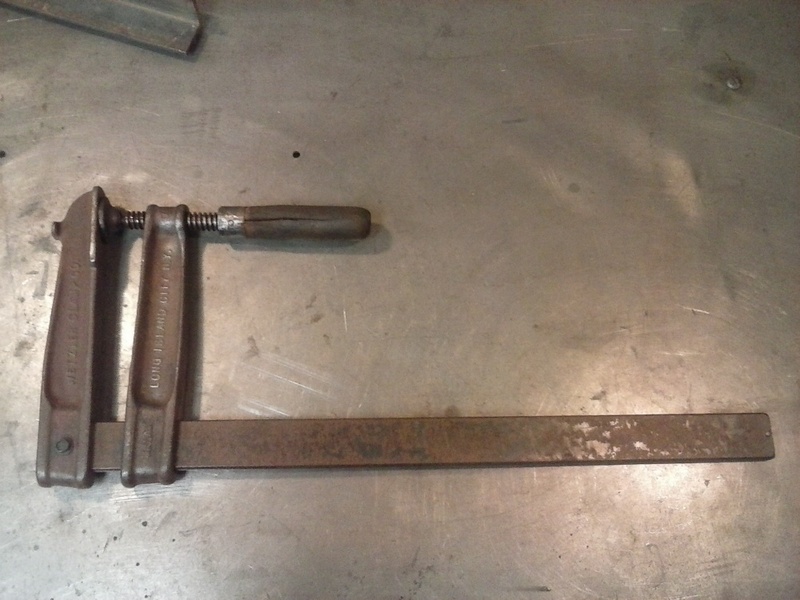 Once I understood that, I noticed they appear on a lot of different makes of clamps, but not, for some reason, on products of the Adjustable Clamp Company (Pony, Jorgensen). Pony bar clamps will, in fact, fall over when set on their heads, which can trigger the environmental hazard of the air turning slightly blue if you're in the middle of a glue-up when it happens. There have been many times that I had to use a clamp to push bearings or a shaft into another piece. Many times I had to hit the clamp to unstick the piece being pushed. Same as a gear puller, tighten it and then shock it with a hammer to loosen the pieces. I don't think you could ever have enough clamps , especially in wood working /boat building ect. nice bring back . will it still keep the chipmunk out? Well, the chipmunk was interested in a bag of sunflower seeds that was intended for birdseed. I had seen the chipmunk and knew I had a problem but realized later it was the seeds. I went to grab a rag off the shelf and found one of his stashes. I looked in the bag of seeds and it was all shells! He prolly ate about a third of the seeds. Now that the seeds are put away he hasn't been around.